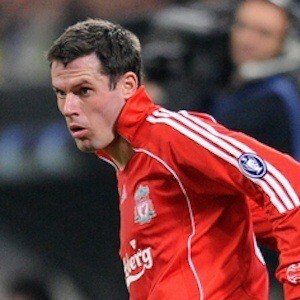 Former defender who starred on Liverpool from 1996 to 2013, helping lead the club to two FA Cups and three League Cups. He also made 38 appearances for the English national team from 1999 to 2010. He began his youth career with Liverpool at age 12. He was named the Liverpool Player of the Year in 1999, 2005 and 2007. He held the record for most appearances in European competition from Liverpool with 150. He married Nicola Hart in 2005. They have two children together, James and Mia. He and Steven Gerrard both served as captains for Liverpool.